The majority of suspects arrested by Houston police get booked at one of two city jails, and within 48 hours they are transferred and booked in all over again at the Harris County Jail. Two years from now, officials say, this duplication will be a thing of the past. The central and southeast police lockups will close, freeing up 100 police officers who were assigned to jail duty. And individuals arrested by city or county law enforcement will enter one building where they will be booked into one unified system and be able to tap into various services based on their needs. For years, local officials have been trying to drum up support for a joint city-county processing center, a model that has existed for decades in Travis County and elsewhere around the country. 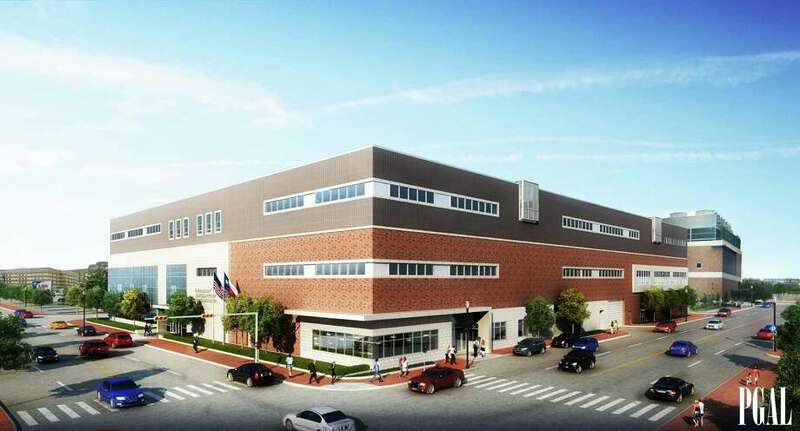 On Tuesday, they broke ground – at what is now a parking lot across from the Baker Street Jail – on a 246,000 square foot facility to be built with $70 million in county and $30 million in city bonds. The Joint Processing Center promises to save money, eliminate duplication of tasks and speed up processing. Through a centralized process, a person who needs detox, dialysis or psychotropic medication will be steered in that direction at the start. This plan takes into consideration both the fact that the majority of incoming suspects are held for a short time and that the Harris County Jail treats more mental health patients than any facility in the state. One goal of the center is to better manage and care for the so-called frequent fliers, many of whom have a confirmed mental health diagnosis and may be homeless, who revolve in and out of the jails on low-level offenses, sometimes without the chance to connect with a social worker or a psychiatrist who could prescribemedicine. Mayor Annise Parker said the new center will save the city $4 million a year in elimination of redundant processes. “We have been laboring in an old and outmoded system, with old and outmoded jails, for a number of years,” said Parker. “The plans for this have been dusted off five or six times. For whatever reason, we don’t finish the conversation to get to a resolution and a contract agreement. Well, we finally made it to the finish line” she said Tuesday, through cooperation of a number of city and county agencies. See here, here, and here for the background. Voters approved funds for this in 2013, so it’s good to see it finally get off the ground. I expect it will make a big difference in how the system works. I hope this works out half as well as planned. Then it can serve as a template for city/county cooperation to combine other services, the animal shelter and crime lab come to mind, as does their emergency communications (dispatching centers). My sources tell me that there will be down sides to the center to though, a centralized booking facility means someone arrested in Clear Lake will then need to be driven all the way downtown to tie up the officer for hours longer in each case, the same for the Willowbrook area or Alief part of town. The current system has prisoners taken from those outskirts to closer facilities and then group processed, tying up a van from each with assigned personnel. The new method means many more single trips. It should money as the city can layoff 300 jail personnel and reassign the police stationed in the jails but the manpower “savings” will probably cut the real number by a significant amount. Then, since the city jails were considered a dumping ground for problem children for years, those defective staffers will have to be placed somewhere else given the city rarely expends enough effort to dismiss those suspected of wrongdoing. All in all though, I think this will be a win if both sides take efforts to make it work.